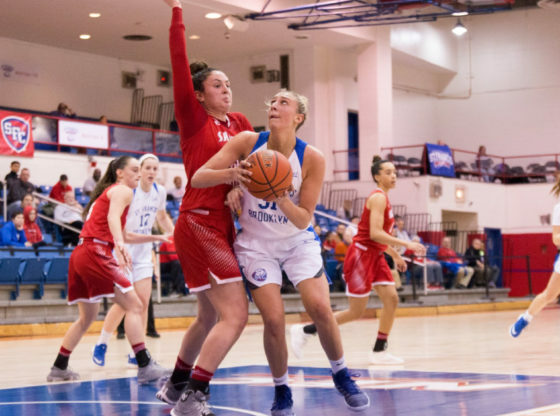 In another nail-biting and overtime game this season, the St. Francis Women’s basketball team (12-9, 6-3 NEC) were finally able to defeat Sacred Heart University (10-10, 6-3 NEC) with the final score of 56-53. The last time out against Sacred Heart, the Terriers lost to the Pioneers at home in the Poor Physical Education Center with the score of 66-68 at the end of regulation. Today’s game was a back-and-forth competition for both teams on offense but Sacred Heart played more aggressive on the defensive end as they finished with 8 steals and 8 blocks against the Terriers. By looking at the final stats, it shows how efficient both teams were on defense as St. Francis finished the game shooting 35% (22-62) from the field and Sacred Heart finishing with 32% (19-59) field goal percentage. The Terriers had a hot start in the game with a 12-2 run early in the first quarter. Sacred Heart had a stronger second half to that quarter as they went on a 13-7 run to only trail by 4 points at the end quarter #1. St. Francis maintained the lead over the course of the first half until Redshirt Senior Candice Leatherwood gave Sacred Heart their first lead of the game with a layup at 2:07 mark in the second quarter. In a nail-biting second half, both St. Francis and Sacred Heart continued to put pressure on defense, forcing multiple turnovers and blocking many shots in the paint. With this defense shown by both teams, the score nearly changed as it stayed within less than five points. The game changed as Grad Student Katherine Haine made her first field goal in the second half to tie the game for the Pioneers with :44 left in the game. Senior Guard Amy O’Niell had the opportunity to end the game in the 4th quarter for the Terriers but missed the game winning layup. That unfortunately sent the game to OT. She was able to gain her retribution as she made the first bucket to start the overtime period and helped SFC get the win. O’Neill played a huge factor in overtime as she assisted the ball to her teamate Dominque Ward which turned out to give the Terriers the lead again over SHU. Freshman Ebony Horton then got sent to the free throw line only making 1 out of the 2 free throws attempted. That was still able to give St. Francis the victory. Jade Johnson finished this game with her second straight 20+ point game as she scored 20 points, 3 rebounds and 2 assists. Johnson shot 38% from the field and 50% from behind the arc. Amy O’Neill ended with her first career triple-double as a Terrier with 13 points, 13 rebounds, and 12 assists. This is also the first triple-double recorded by any player who wore a Terrier jersey on the court. Candice Leatherwood on Sacred Heart led her team with 21 points, 5 rebounds, and 3 assists in today’s matchup. With this win today, St. Francis College are now tied with Sacred Heart and Saint Francis (PA) in second place in the NEC standings. The Terriers have now ended their four game road trip and will now head back home to Brooklyn Heights as they will look to face Fairleigh Dickinson University next Saturday, February 9th, at 1:00 pm.